Gregory Duffy graduated with a Bachelor of Engineering in Chemical Engineering (Honours and the University Medal) from the University of Sydney in 1971 and subsequently received a PhD from the Department of Chemical Engineering, University of Sydney in 1976. During his career his main research interests have been combustion, pyrolysis and environmental process technologies. Applications include oil shale, coal, low grade fuels and wastes, solar thermal reforming and syngas processing. A large part of his work has been concerned with the application of fluidised-bed technology to such processes, in plants up to the pilot plant and commercial scales of operation. Other interests include supercritical extraction, integrated gasification combined cycle and advanced power generation systems. In addition, he was responsible for the development of the Hydrodec process which regenerates transformer oils and simultaneously destroys hazardous organochlorine contaminants. He was also responsible for the development of a solar thermal/fossil fuel hybrid system to produce decarbonised (hydrogen rich) fuels that can then be fired in advanced power and heat generation technologies. He joined the CSIRO Division of Fossil Fuels in 1976 and worked on the fluidised-bed combustion of Australian coals and coal washery wastes until 1984. From 1984 to 1986, he was a project scientist at the Joint Coal Board where he managed a pilot plant demonstration project for the fluidised-bed combustion of coal washery wastes. 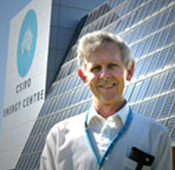 He returned to CSIRO in 1986 as a Senior Research Scientist rising to Principal Research Scientist and then Senior Principal Research Scientist by 2004. He became project leader and manager of the Process Development Group from 1995, responsible for managing and directing projects relating to renewable energy, greenhouse gas mitigation, oil shale processing, coal technologies and environmental process technologies. the project outcomes for existing infrastructure including designing technologies that are able to be retrofitted onto existing power plants in order to preserve assets and reduce emissions associated with their operation. As a leader for the Solar Reformation of Natural Gas project, he was responsible for assessing the thermocatalytic decomposition of methane into solid carbon and hydrogen using solar energy to drive the process. development of an IGCC coal value model. He is the author or co-author of 85 papers and 80 reports to government and industry. Duffy GJ, 2010, Personal communication.